Kidsafe Victoria today issued a RED ALERT to parents in relation to the increasing danger to children of flash flooding in both urban and rural areas following recent heavy rains. Melanie Courtney, Manager, Kidsafe Victoria said, "Parents need to be aware of the dangers of local creeks and storm water drains. Local suburban creeks and drains have proved deadly in the past with the tragic death of a young boy in Gardiners Creek." Earlier this week we saw the rescue of another small boy from a dangerous situation by a TV Cameraman which dramatically showed the extent of the changing creek conditions. Large amounts of water funnelled into channels through the suburbs can create major safety issues as raging torrents can soon sweep children away. Parents need to recognise that extreme weather with flash floods and high winds can turn local environments into extremely dangerous places. Ms Courtney said, "Parents with young children should make it part of their family safety plan to be aware of the presence of any local creeks or streams that could become dangerous during and following storms." "Children are often attracted to waterways through their natural sense of curiosity, however they aren't yet equipped to recognise the dangers waterways carry," she said. "Slippery rocks and mud can increase chances of falling in, while fast-flowing currents and underwater hazards such as tree branches and debris can also prove fatal." "Child drowning is often quick and silent and can take as little as 20 seconds. Be aware of creeks and waterways which may have flooded near your home, local park or playground and ensure your children stay well away from them. 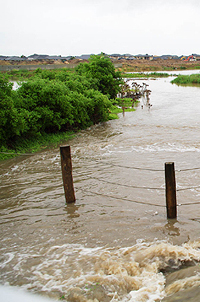 "It is also important to recognise these creeks and drains can still remain dangerous for days after the rain has stopped depending on the amount of water coming from upstream." Kidsafe would appreciate some consideration to naming local dangerous hot spots for flash flooding - Councils probably are the best source of information.